I am a teeny-tiny ok HUGE snob when it comes to Mexican food. My husband and I spent a few months living in Mexico and everything I thought I knew about Mexican food was changed. I came away with tons of favorite recipes, like Authentic Mexican Rice, delicious homemade corn tortillas, homemade tamales and my favorite homemade horchata! My idea of good “tacos” is super snobby now too. There’s nothing quite like an authentic Mexican street taco! There’s a restaurant in my home town of Park City that makes some pretty legit Mexican food (It’s called El Chubasco, if you’re ever visiting!). I love their Camarones a la Diabla and street tacos, but my all-time favorite thing on the menu is their cheese enchiladas. They make them just how I loved them when we lived in Mexico! Super cheesy, served with red sauce and shredded cabbage, diced tomatoes, cotija cheese and sour cream on top. They are HEAVENLY. My husband and I could eat these at least once a week. And the best part–they’re super, super EASY! 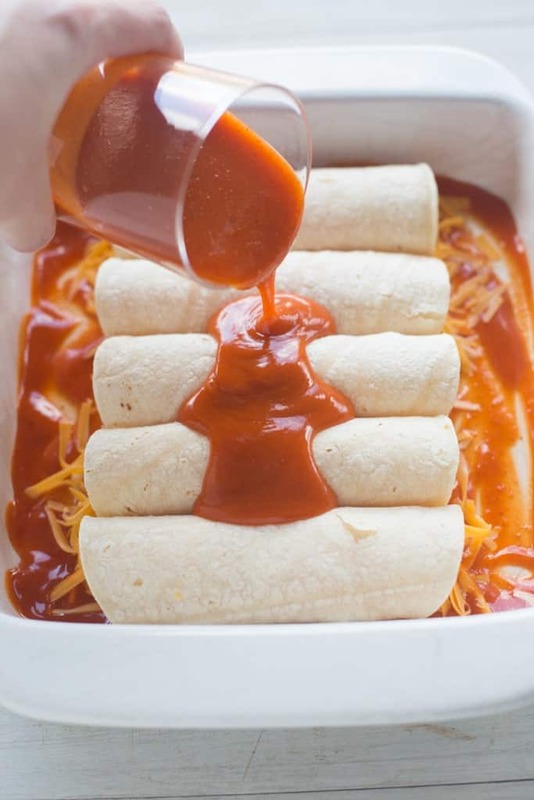 If you use a great brand of canned enchilada sauce, they’re even easier. Or you can always make the sauce from scratch! Olé! 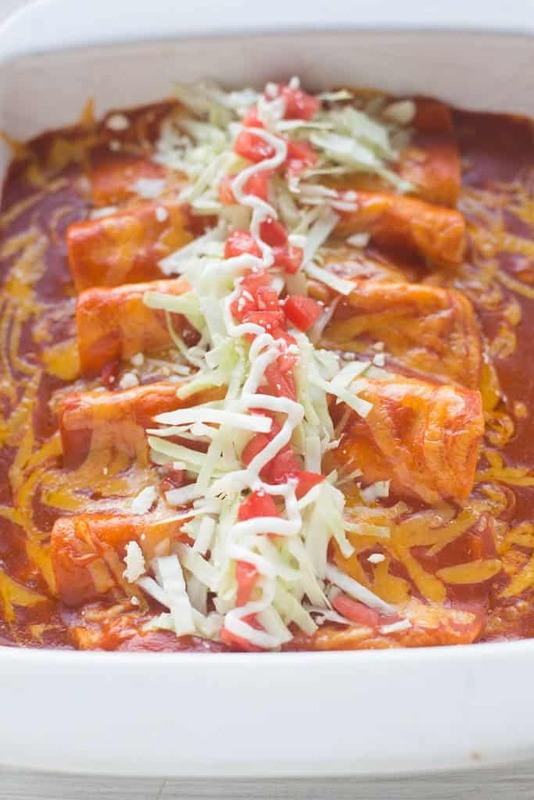 What kind of tortillas should you use for authentic cheese enchiladas? This recipe calls for white corn tortillas, but ifIf you enjoy flour tortillas, those will work great! It’s important to warm the corn tortillas to make them easier to roll for enchiladas, and to prevent them from cracking. To warm the corn tortillas, place them on a hot skillet or griddle and cook them for 15-30 seconds on each side. Just made these tonight. Very good!! I just put avocado on mine. Easy to make. Made these Friday night for dinner with cilantro lime rice and an avocado and tomato salad. I never used flour and oil to thicken enchilada sauce, but I’ll try that tonight, thanks! As it happens – my wife and I are traveling to Park City Monday, so we’ll be sure to check out El Chubasco while we’re there. Thanks for the tip! I hope you had the chance to try El Chubasco. Their cheese enchiladas are the best! Thanks for your comment. Making these in a little bit! ? Uncovered! Hope you love them! Its donna, my kids want cheese enchiladas, with no enchilada red sauce. So do I just stuff their flour tortillas with cheese , roll, and more cheese on top? But should I pour some enchilada sauce on the bottom anyway? There is a local restaurant here that serves cheese enchiladas in red sauce with the best pork roast with roasted peppers, onion and tomatoes. I’ve wanted to recreate their dish for quite a while. The problem that I am having is finding the right cheese. It’s a queso of some sort but not the liquid kind. Would you happen to know which cheese I am talking about? Sounds amazing. Is it a white cheese? Is it used for inside the enchiladas or sprinkled on top? Sprinkled on top would be cotija cheese and melted inside could be oaxaca cheese. Yes, it is a white cheese and it is for inside. I have never heard of Oaxaca before. Now I will be on the hunt for it. Thank you so much! I actually have some cheese enchiladas in the oven right now but used generic shredded queso since it was the only thing I could find (*sigh). We made this for SeisDeMayo 🙂 and loved it. The sauce was super easy to make and tasted so much better than store bought. We also made the rice and that was a hit too! My BF has been wanting to learn how to make Mexican Rice and is super stoked to have found these recipes. Tomato Bouillon, who knew?! Thanks for sharing Debbie! 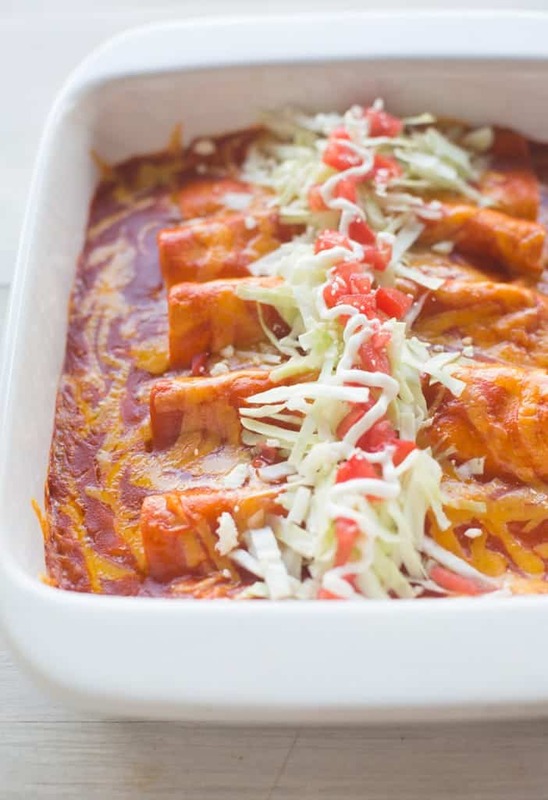 So happy to hear you made the enchilada sauce, enchiladas and Mexican rice! Sounds like a fantastic meal to me! Thanks for your comment. With so many recipes out there, I chose to follow yours for a number of dishes since I like your style of cooking, explaining and organizing! 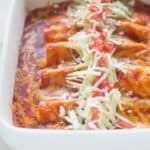 I did make the enchilada sauce from scratch using your recipe and the enchiladas were perfection! I got many compliments from appreciative guests and had made an extra batch which we enjoyed the following days. Thanks so much for sharing Anita! I’m so flattered you chose to use so many of my recipes for your guests! Yum! I would season both with salt and pepper, and maybe a little bit of garlic powder on the chicken. Enjoy!